The invitations have gone out and the final preparations are being made for the big wedding of HRH Prince William of Wales and Catherine Middleton at Westminster Abbey in London. HSH Prince Albert II of Monaco and Miss Charlene Wittstock are going to be attending, representing Monaco and the Princely House of Grimaldi. There was some speculation about whether or not Princess Caroline and wandering husband Prince Ernst August V of Hanover (a member of the extended British Royal Family) would be attending -that could have caused some uncomfortable moments. However, such things are considered and neither one was invited, which is, of course, more of a slight at Ernst rather than Caroline as the head of her family will be attending, but not the head of the Hanoverians, her husband. The last time Princess Caroline and Prince Ernst August attending a British Royal event was the funeral of HM Queen Elizabeth the Queen Mother in 2002. When HRH the Prince of Wales and Diana were married in 1981 at St Paul's Cathedral, HSH Princess Grace of Monaco attended the event as did the (then) Hereditary Prince Albert, so this event will have some extra significance for Prince Albert. On another sad note, the funeral of Princess Grace was the first official royal event for Diana as Princess of Wales. Prince Albert II has said that he will be 'taking notes' on how William and Kate have organized things as he and Charlene prepare for their own wedding. As we have discussed before, Prince Albert is distantly related to the British Royal Family, being descended from the Kings of Scotland, through the marriage of HSH Prince Albert I and Lady Mary-Victoria Douglas-Hamilton. It also might be fun, on this occasion to take a look back at a past post: Britain and Monaco - Did You Know? listing some fun facts about the long ties, sometimes friendly and sometimes not, between Great Britain and Monaco. 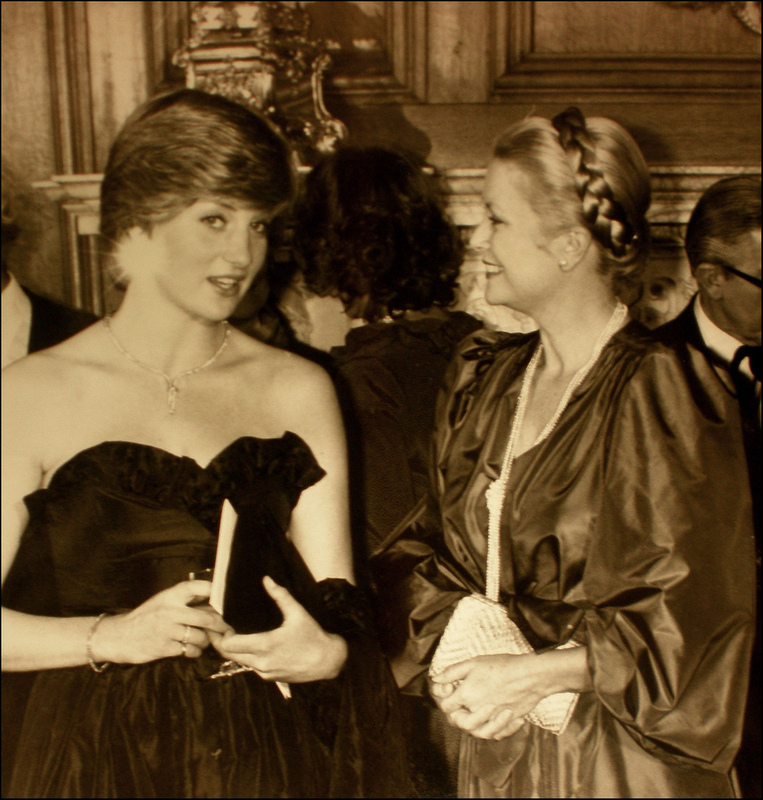 Wasn't it also Grace's poetry reading (event where the featured photo of this entry was taken) where Diana had her first formal appearance as the fiancee of Charles? But not unexpected. Prince Edward was the rep at Albert's enthronement. The higher-up royals usually do not attend such events on the continent. The Queen of course never does (the only exception being the funeral of King Baudouin of the Belgians). Every now & then (such as at the wedding of the Crown Princess of Sweden) the people on the continent get a little upset that their 'top tier' attend British royal events, but the 'top tier' of the Windsors rarely or never do. It's a pity that Grace and Diana did not have more time to form a friendship, as Grace might have been able to be a steadying influence on Diana. Watching the English Royal Wedding -- Grace's influence in fashion is immortal. Kate Middleton's gown is reminiscent of Grace's. Of course Grace was perfection, so it would be wise to be inspired by her. Do you think that is the British monarchy or the Spanish one more important and prestigious? The British get more press and more well known in the US, the Spanish I think are more prestigious lineage wise, as the Prince and the Infantas are products of the Spanish Royal Family and the Greek Royal Family. Prince Philip is a member of the Greek Royal Family too, but Queen Sofia is the daughter of the Greek king himself.